It's an unfortunate synchronicity for all but the toffs among us that when the Sun hits 00Cap:00:00 on December 21, 2013, aka Winter Solstice 2013, the difficult midpoint of Saturn and Neptune ('Saturn-Neptune') trods upon Mr. Underworld himself, the Arch Spy, Saboteur, and Wealth-Hoarder, Pluto, so we end 2013 with a depressive, oppressive midpoint picture of planetary energies affecting the collective mindset and setting the table for major denials of guilt from responsible parties, particularly from within the Plutocracy class of manipulators. As you know, secret/invisible (Neptune) government (Saturn) is a constant charge made against the United States of America since its founding days with its natal Saturn @14Lib48 in 10th house and natal Neptune @22Vir24 in 9th house snugged about our natal Midheaven @00Lib53, a point that turns up in the horoscope you see above conjoining the Vertex, a point of encounter, and a degree/point which squares the Winter Solstice Sun each year. Yes, that Point of Fate (VX) sits upon US natal Midheaven (MC) in the 'Sibly' chart (July 4, 1776 5:10 pm LMT Philadelphia, PA) at a World Point of Prominence (00Libra) so the karmic quality we feel concerning current events is well justified by the cosmic reflection of current-day goings-on in Washington, our archetypal representative. All of this is engineered by Those Who Engineer, although 'imagineer' might be closer to their shriveled little Uranus-Neptune minds and hearts...if only they possessed organs of compassion and empathy for their fellow man and guilt over the destruction they, the politicians and their corporatist backers, are perpetrating upon We the People, and against the US economy. We could use the karmic 'reap what's sown' motto here since debts tend to catch up with anyone who racks them up (a debt-ceiling raise is meant to pay Congress' already-incurred bills--will it be settled only until Nov 15th or Dec 15th?) and apparently, our usurping Tea-like activists have 'cremated' (any sense of) 'care' for humanity years ago. If so, this is a decrepit condition which may partly explain how they can look at themselves in the mirror each day given their anti-American antics which are egged on by delusions of grandeur and goals of ego-recognition--and a yearning for 'a place' at the Rulers' Table once the dust clears and the rebuilding begins, the sots. 1. Mars opposes Uranus (1A42), an explosive combination and a time when group organizing is quite impossible; many activities could be disrupted and it's impractical to attempt to predict what actions may be taken especially when there are new or unusual conditions and circumstances afoot; crowds are volatile now so stay clear of them, whenever possible. 2. Mars squares Pluto (4A00), a period when jealousy, revenge, and, above all, power struggles are in play; obstacles due to past actions must be dealt with appropriately before progress can be made though a large amount of anger, even rage, may be contained within these old situations. Accomplishment is possible, if the dynamic is positively utilized, yet there are potentials for destruction, even catastrophe, if the forceful energy is not well-managed. And inside The Beltway of Washington DC, what are the chances for good and well-meaning management any more?, sad to say. Mars-Pluto also has a 'Higher Power' vibe which can interrupt even the most Machiavellian machinations of current political operatives and plutonian agents of a sinister kind. 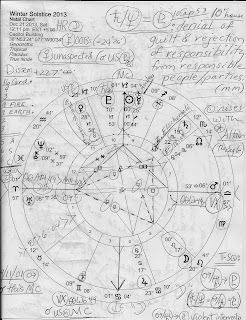 Naturally, the above info pertains to the dynamic T-Square between Mars-Uranus across the 1/7 polarity (Self/Others) which has outlet for expression at 10th house Pluto who probably manipulates the explosive energies of Mars-Uranus, rather than the other way round. 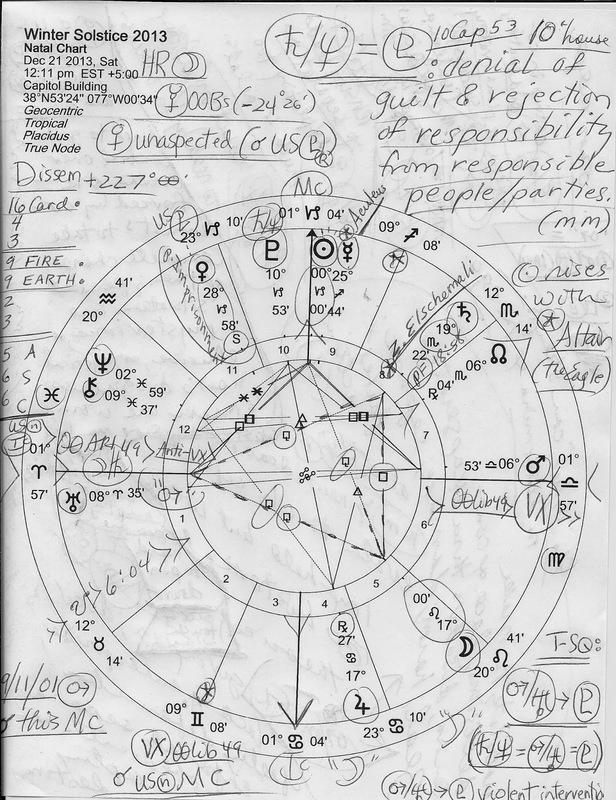 Now this is a Cardinal (initiating; active; physical) T-Square and with an apex Pluto, signifies obsessions with complex undercurrents of a longstanding nature (karmic, or, fated) which cause a one-pointed, consuming focus; tactics to gain control include subversive actions, willfulness, manipulation, and a 'possessed' quality of behavior. Privacy and secrecy are tools of choice so that opponents may be unexpectedly 'overwhelmed' by the ruthlessness readily used by plutonians determined to get their way with few, if any, concessions. No less than complete transformation is considered worthy of their efforts and once they're done taking over, they don't intend that anything in America will ever be the same. Well, perhaps the typing of this post may be completed at a later date for much is there to be done in the real world with more and more Americans needing practical aid especially since the November 2011 'sequester' cuts which slight-of-hand Republicans have managed to make seem like budgetary 'business as usual' and through which Atlas Shrugged adherents--including the blind-zealot Uranus-in-Aries types ("anarchists"--Ebertin says of rebellious Uranus when in Mars-ruled Aries) are determined to tear down, not build up our nation. Throw the weak overboard! they shout, and there will be more for the rest of us! Which for me supports my personal contention that if we allow anti-government behavior to fester long enough, we've got a major Coup of State on our hands. Yet hopefully, by December 21, 2013, the November 3, 2013 Solar Eclipse with its Uranus-Neptune content will have awakened even more of The Masses to the real solutions necessary to support, not tear down, our America. Update: more has been added concerning Winter Solstice 2013 at Jude's Threshold.